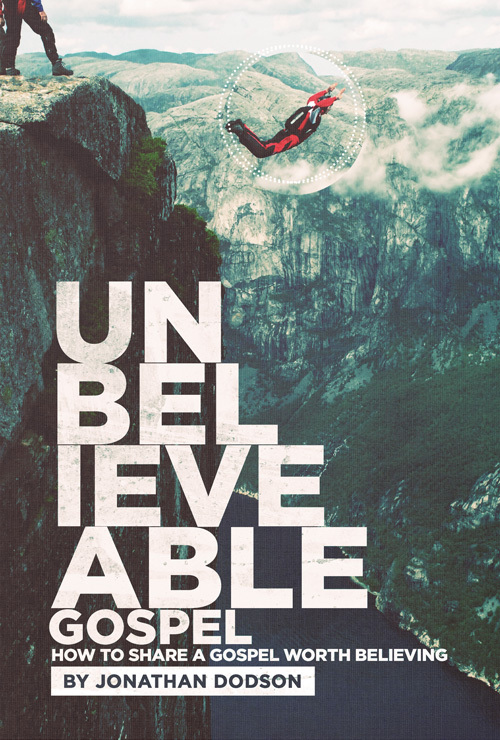 Most of us share an unbelievable gospel. We cough up memorized information about Jesus that has little apparent meaning for life. If we’re honest, we don’t exactly know how Jesus is good news for others; we just believe he is. The problem with this is that non-Christians don’t share the “advantage” of mindless belief. “Just believe in Jesus,” we say, but what we tell them is so unbelievable! In their bad news, they can’t conceive how a dying Jewish messiah could be good news to them. Alternatively, their best news seems to trump our good news. This is where our calling to “do the work of an evangelist” comes in (2 Tim 4:5). The workplace crusaders and angry street preachers who campaign to convert co-workers to their doctrine or recruit bystanders to their politics are also unbelievable. Even the well-intentioned evangelical who looks to get Jesus off his chest and into conversation is unbelievable. Too many Christians look to clear their evangelistic conscience by simply mentioning the name of Jesus or saying that he died on the cross for sins. Saying Jesus’ name in conversation earns us a check. Mentioning what Jesus did (on the cross) earns us a check +. This performance-based approach to evangelism is incredible because it fails to embody the truth we preach. Dismissing people’s struggles, fears, hopes, and reasons for unbelief, we plow onward with our name-dropping. This is unbelievable. This is a book on evangelism, though I struggle to use that word because of all its baggage. 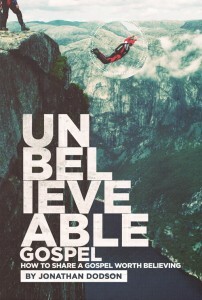 More importantly, it is about the gospel of Jesus Christ. The gospel is both bigger and smaller than we think. Sometimes we can’t imagine the scope of the gospel, as news so good that it changes everything—society, culture, and creation. People really need to hear this. This vision of reality is better than anyone can imagine. The good news of the gospel is better than the best news people can conceive. Others times, we can’t imagine the subtlety of the gospel, that it brings us exactly what we need in Christ: acceptance, approval, forgiveness, newness, healing, worth, purpose, joy, hope, peace, and freedom, all in Jesus. The gospel is bigger and smaller than we think, as big as the cosmos and as small as you and me. It is the good and true news that Jesus has defeated sin, death, and evil through his own death and resurrection and is making all things new, even us! I have limited the scope of this book to the smaller expression of the gospel. It is mainly practical, focusing on how we can better communicate the gospel better to others. True to the original meaning of evangelism, this book is about how we herald the good news of Jesus Christ.